Synopsis: Like any other Saturday night, Gabby Perez and her best friend, Maria, are out dancing. But this isn’t just another night. When a mysterious stranger warns Gabby their drinks have been drugged, she hurries Maria home. Sure enough, the next day, Maria can’t remember a thing. Gabby’s shaken by their close call. And she’s not going to stay quiet about it. She opens up the airwaves on her radio show and discovers an even worse truth: the guy who drugged them was going to force them into prostitution. Then Gabby’s friend Bree never makes it home from a party, and Gabby fears the worst. Gabby reaches out to the guy who saved her, the gorgeous stranger she knows only as X. As they dive into the seedy underworld of Miami, searching for Bree, they can’t ignore their undeniable attraction. Until Gabby discovers the truth about who X really is and the danger that surrounds him. Can their love survive the light of day? Light of Day is set in the same world as On the Edge by Allison Van Diepen and follows Gabby Perez and X.
Seventeen year-old Gabby is a student, recently broken up from her ex and finding her way with new friends and her nightly radio show. She was a likeable, strong character. At the beginning of the book Gabby is at a club with her best friend Maria when she is alerted by a stranger that their drinks had been spiked. The following day she makes the decision to talk about this on her show to make others aware of this predator. X was Gabby and Maria’s saviour, I enjoyed his character - he was protective of those around him and determined to bring the bad guys down, even if it meant introducing Gabby to his gang-related, dangerous world. He was quite the mysterious character as Ortiz was in the first book and I liked the reasoning for this. When Gabby’s school friend Bree disappears she is convinced that she has been lured in or taken by the same guy who tried to get her and Maria into his prostitution ring so with X’s help, tries to locate her and convince her to leave but things don’t always go to plan. I enjoyed the gang aspect and what they were trying to do, it is a little far-fetched but it was entertaining none the less. Despite the romance feeling a little rushed, I didn’t mind the interactions between Gabby and X but their lives couldn’t have been more different with X being a gang leader with a rough past and Gabby still a student and quite innocent. Their relationship felt more one sided on Gabby’s part, he always seemed reluctant so I was happy when he was more open with her. Light of Day was well written with an intriguing storyline. The characters were each interesting and the romance despite lacking oomph was nice. I had a few issues with this book but overall it was a fun read with some great action scenes. 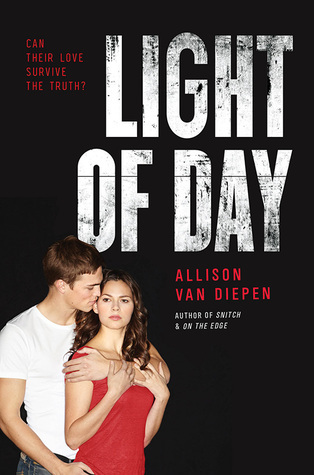 Thank you to Harper Teen via Edelweiss for the opportunity to read and review Light of Day by Allison Van Diepen. Allison van Diepen is the author of seven teen novels: Takedown, Street Pharm, Snitch, Raven, The Oracle of Dating, The Oracle Rebounds, and The Vampire Stalker. Her novels have been named ALA Quick Picks for Reluctant Readers and New York City Public Library Books for the Teen Age. I felt that the romance was rushed in the first book too, which is why I didn't pick this one up. I'm glad you were still able to enjoy it though, Sharon. Despite a few issues, this does sound interesting and I like the whole airwaves angle. This sounds like something I might like. Thanks for the great review.